RIGOL Announces New 7000 Series Digital Oscilloscope. 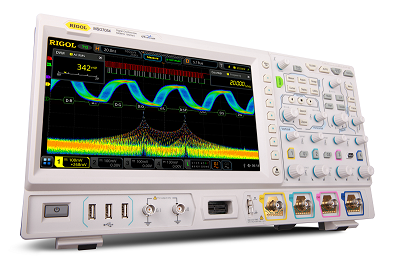 Beaverton, OR – June 12, 2018 - RIGOL Technologies announces a significant addition to its oscilloscope portfolio with the introduction of the?New 7000 Series Digital Oscilloscope. The 7000 Series delivers unmatched price/performance capability in a mid-range oscilloscope. With 10GSa/sec Sample rate and up to 500M Record Length the 7000 Series can deliver 20X Oversampling on a 500MHz signal providing unmatched signal resolution while still capturing a full 50ms; significantly longer than available in competitive products. The core of the 7000 Series Oscilloscope is RIGOL’s new UltraVision II architecture and its Phoenix chip-set. Two custom ASICs provide analog front end and signal processing performance. These chips are surrounded by a high performance hardware design including Xilinx Zync-7000 SoC, Dual Core Arm-9 Processors, Linux +Qt Operating System, High Speed DDR System Memory and QDRII Display memory. This architecture enables a high waveform capture rate of 600,000wfms/sec, color graded intensity display, and outstanding time-base accuracy and jitter performance. "RIGOL will be celebrating our 20th Anniversary in 2018. We shipped our 1st Oscilloscope in 1999 and the 7000 Series represents our 10th generation oscilloscope. We are very excited about our new proprietary chip-set and the transformational capabilities it allows us to bring to market," says Michael Rizzo, General Manager of RIGOL North America. "Constant innovation has allowed RIGOL to reduce our customers cost of test while still delivering uncompromised performance products. The new Phoenix Chip-set is an investment in technology that will be a building block for years to come." The 7000 Series comes with a next generation user interface giving the customer five unique ways to interact with their instrument. A vivid 10.1" (1024x600) display supports a responsive and intuitive touch navigation. Customers requiring a larger display can take advantage of the native HDMI support to drive large displays and control the instrument with a mouse. The DS7000 also supports a touch enabled browser capability so you can control the instrument on your network via a tablet or smartphone. Traditional knobs, buttons, and soft keys are still available for those who choose to work with a traditional UI. Lastly, the UltraScope remote control and display software will let users interface with the unit directly from their PC. Solving customer’s challenges requires analysis capabilities and the 7000 Series provides a comprehensive set of advanced analysis tools. Six-in-One capability provides multiple instrument types. Oscilloscope, Logic Analyzer, Protocol Analyzer, Waveform Generator, Digital Voltmeter, and Counter/Totalizer are all integrated into the 7000 Series. Beyond that tools like Zone Triggering, 41 Precision Measurements, Multiple High Resolution Color FFTs, as well as standard Histogram and Pass/Fail Analysis make the 7000 Series a powerful mid-range debug solution. "We believe the 7000 Series is simply the most powerful and affordable mid-range oscilloscope in the market,” continues Michael Rizzo.? “With category leading performance, robust analysis tools, and a next gen UI, delivered at a starting price of only $2699, we encourage customers considering the MDO3000 from Tektronix or the DSOX3000T from Keysight to compare the performance, features and overall value of the RIGOL 7000 Series Oscilloscope." The 7000 Series is available and shipping now. There are 8 Models (100MHz, 200MHz, 350MHz, and 500Mhz) with or without the Logic Analyzer (MSO). Pricing Starts at just $2699. Learn more about the RIGOL 7000 Series Digital Oscilloscope at?www.wohh.tw. Please contact RIGOL or any authorized partner for information. RIGOL Technologies is transforming the Test and Measurement Industry. Our premium line of products includes Digital and Mixed Signal Oscilloscopes, Spectrum Analyzers, Function/Arbitrary Waveform Generators, Programmable Power Supplies and Loads, Digital Multimeters, Data Acquisition Systems, and application software. Our test solutions combine uncompromised product performance, quality, and advanced product features; all delivered at extremely attractive price points. This combination provides our customers with unprecedented value for their investment, reduces their overall cost of test, and helps speed time to completion of their designs or projects.